Submitted by peter on 29 December, 2009 - 19:30. A while back I did a speculative piece and suggested that the Nissan Eco Car could be on the market as soon as October 2009. Well, it's now almost 2010, so I guess you win some, but not the rest. Is that clear enough for you? In case you are scratching your head, don't worry, I'll explain everything. 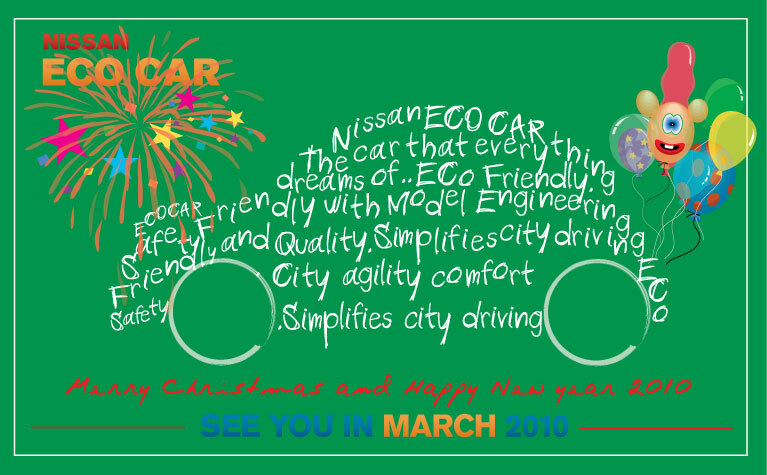 First, the "Merry Christmas and Happy New Year 2010" is simply an excuse to send this card out, because it is just a teaser for an upcoming launch by Nissan. Subtle it is not! "Nissan ECO CAR. The car that everything dreams of... ECO Friendly, Safe, Friendly with Model Engineering, Friendly and Quality. Simplifies city driving, safety, City agility comfort, Simplifies city driving. There is also the odd "Eco Car" and "Eco" thrown in here and there for good measure. I'm guessing not a lot of effort went into this, but the shape is unmistakably the Nissan March. The March is known as the Micra in some markets, but I'm guessing that it will be designated the Nissan March in Thailand. The clue? Well, at the bottom of the card, it says "SEE YOU IN MARCH 2010"! Perhaps I'm the only one who was starting to lose hope in the Eco Car project. But finally, it seems we are only months away from the Nissan offering.